Bagan the beautiful | Where in the world are the Uricks??? Our guide, Min, took us to “no name” monastery – a relic that was once a monastery, but now offers a superb panoramic view of Old Bagan and the 4,000 temples, pagodas, libraries, and monasteries. Many of these structures are from 9c-12c (older than Angkor Wat), but, unfortunately, many were damaged in a 7.0 earthquake in 1975. The amount of restoration work that has been completed is quite amazing, and thankfully so, as these ancient monuments would soon disintegrate completely. Adjacent to “no name” is a brick factory where each brick is made by hand to the tune of approximately 1,000 a day! With all the brick structures in Bagan and the restoration work that is ongoing, it would appear they have good job security! We stopped for a quick “cuppa” at a local tea house tasting both the thick, sweet, dark tea and a green tea. We then went to visit a bean paste factory where, once again, everything is on a small scale and done without machinery. The soybeans are cooked and strained off (and then sold to farmers for pig food – the women waiting), the water is cooked down over many hours to a thick, dark paste; this is then packaged as small pellets or pulverized and sold as powder. This factory is now owned by a woman, with whom we spoke, and her brother, having been handed down from their grandfather who started the production 80 years ago. Onward to the local market – I have become quite the expert at all the local produce and food items! The markets never fail to entertain me. The magnificence of Shwe-Zigon pagoda is indescribable. Also this pagoda was damaged in the earthquake and the entire upper dome needed to be replaced. One single monk raised all the money necessary by collecting donations from local people. A few more stops at some temples and then for lunch at The Moon – Be Kind to Animals restaurant. Delicious guacamole (they have the most beautiful avocados which are currently ripe), tamarind-leaf curry and pineapple curry with coconut rice. Yum! 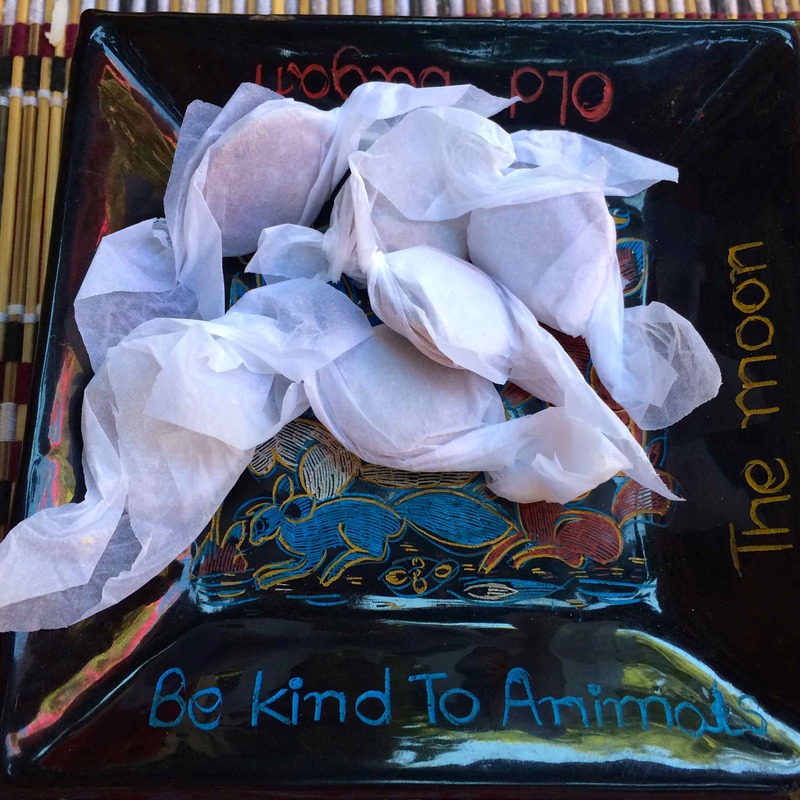 My new addiction – tamarind paste candy – discovered yesterday! This entry was posted in Eating Out, FOOD, Markets, Myanmar, TRAVELLING. Bookmark the permalink.